At the start of the meeting, we were asked why the need for an extra-ordinary meeting, and we queried why this question was being raised when the statute clearly stated that 50 signatures from the membership was all that was needed to convene a meeting, and we submitted 81 signatures. We were told that the governing board needed this information in order to make preparations for the meeting. An agenda was needed, and the board also had to have a sense of who would be needed from various quarters of the Organization in order to respond appropriately to the concerns being raised. We were also informed that the timeline for the meeting is uncertain, as many of the people needed may not be available. To illustrate the complexity of planning such a meeting, we were told that it required some three months to plan the AGM. We confirmed our preference, as indicated in our request, to have the meeting convened before the Pension Board meeting. AFICS inquired about the significance of convening this meeting before that of the Pension Board. We indicated that we wanted to ensure that our concerns were heard and registered in the appropriate fora. As regards the concerns of the group, we indicated that despite reassurances of no change in the investment policy with respect to increasing the size of the portfolio in alternative investments such as hedge funds, we were seeing persistent press reports to the contrary. First the MSNBC report, which was followed by the Opalesque report regarding an EOI that suggested an expansion of the Fund's portfolio in private equity, hedge funds and other high risk financial instruments. It was explained that the MSNBC report was based on erroneous information leaked to the press that was subsequently retracted. We expressed concern that there was in fact no formal retraction in the press. Consequently, that bell remains un-rung. As regards the EOI reported on in Opalesque, AFICS reps explained that this related to the procurement of ongoing housekeeping services that keep track of the financial instruments in the Fund's portfolio. They are renewed every five years and are an integral part of the Fund's system of checks and balance. The reference to alternative investments is a function of boiler plating for contingencies. However, it is not an expression of intent. Any move to expand investments in riskier financial instruments would require decision-making through a complex structure, which is not easily achieved. The MoU was cited by us as another cause for concern. While assurances were given that the structure of the Fund would not change, there was implication in the language of the version of the draft we reviewed that could change the operation of the Fund in a manner that would conflict with the segregated structure mandated by the GA. In particular, the tripartite nature of the draft MoU, which now introduces the RSG as a new signatory, and requiring consultations between the parties on HR matters that are separate and distinct from each other under the structure of the Fund was indicative of a trend towards consolidation and indeed troubling. We were told that there were, indeed problems with the original draft, but that they have been addressed or are in the process of being rectified in the revised draft presently under review. We have not seen any such draft, however and would continue to work on the basis of the one we now have. It was also felt, by those concerned by these issues, that much of what was being addressed under the four exclusions did not require an MoU. As such, the question is being raised as to whether this change is simply part of a deliberate, ongoing trend towards consolidation of the liabilities side and the asset side of the Fund that could erode checks and balance mandated by the GA.
We were told that these kind of charges of empire building have been leveled as far back as 2000, when Raymond Giery was Secretary of the Fund's Secretariat. We offered a concrete example where there was consolidation of IT systems by Operations that, in fact, had an adverse impact on the functioning of Investments Management Division. It is these incremental changes over time operationally that are cause for concern, given that their trajectory is on a path that clearly conflicts with the intended structure of the Fund. Concern was also expressed about the unexpected resignation of the Chairperson of the Investments Committee. It was unclear whether this resignation was prompted by the management change arising from appointment of the new RSG, and consequently, a change in investment policy, approach, or philosophy. But clearly, this remains a mystery, and it has resulted in a vacuum that remains to be filled. We were informed that the chair of the Investments Committee is being rotated, pending election of a replacement, on a monthly basis, which is neither effective nor sustainable. As to the question of concern that we raised, we were told that the RSG would be in the best position to respond. Last but not least, the issue of staff-management relationship at the Fund Secretariat was discussed. There is view that it has been a dysfunctional environment that continues to deteriorate. We raised the question as to whether this should not also be a matter of concern to AFICS, as after all this is in fact the entity that administers the benefits of retirees. We also raised the issue of monthly and bimonthly Pension Board reports being made available to a wider audience, particularly on line, where more and more UN reports are being posted. It was agreed that an extra-ordinary meeting will be convened. However, the matter is to be further discussed with the governing board and we will be informed of the date of the meeting. We emphasized that we didn’t want just another meeting with bland assurances being provided by the CEO and the RSG as in the past. We wanted speakers who could provide substantive and technical explanations and clarifications along similar lines as had happened during the current discussion. There was agreement to have that kind of discussion if the right expertise could be available for the meeting. It was agreed that on conclusion of the next meeting of the governing board of AFICS, it was agreed that the leadership would inform us of the date when the extraordinary general meeting on pension issues is to be convened. 1. The complete segregation of the investment function from the servicing and payment of pensions has worked well in the past, what possible justification could there be for believing that merging them now would respond to any recognizable need? 2. 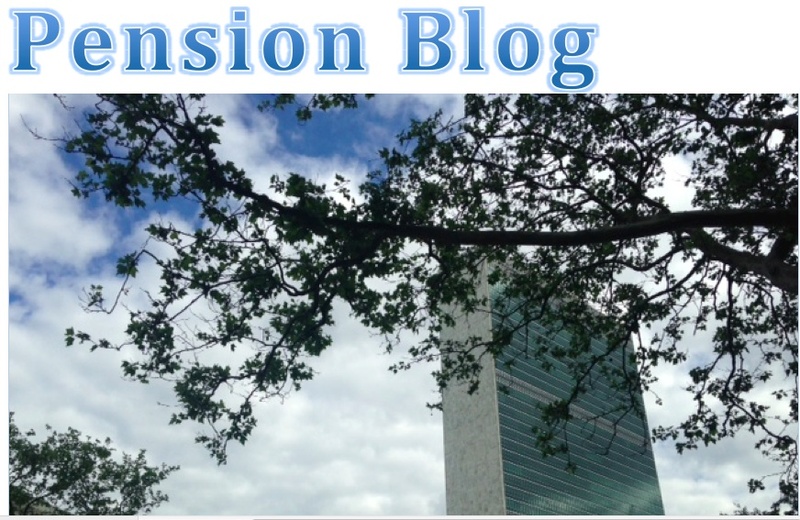 Other than general claims for “more flexibility,” what are the specific problems in human resources management within the Pension Fund that cannot be solved under the existing regime of UN staff rules and regulations covering employment? 3. Why are there continuing press reports about increasing alternative investments, when senior officials keep insisting there are no such plans? Such stories, which sow discord and anxiety, have to come from officials within the organization. Are these trial balloons to test the waters or real attempts to get something started? How do we stop this kind of irresponsible behavior? 4. Where is the impetus coming from to increase the risk profile of the investment portfolio? Can the fund continue to prosper by maintaining the current risk profile, i.e. keeping the conservative approach we have taken in the past? Is there a shortfall between investment returns and the money needed to pay benefits, since, in any case, benefits are paid from current contributions of serving staff? 5. What are the safeguards against any one official taking decisions that will increase the investment risks faced by the fund? What penalties can be put in place to sanction any official or officials who take unnecessary investment risks? 6. How can transparency over pension fund decision-making be increased? What are the various bodies that have some role in taking pension fund decisions and why can’t participants and beneficiaries have greater access to documentation and reports that the various bodies are working on?